Cruises from Baltimore depart year-round. Baltimore is centrally located on the U.S. East Coast, within a four-hour drive or less of major cities such as New York, NY; Harrisburg and Philadelphia, PA; Richmond, VA; Trenton, NJ; and Washington, DC. Baltimore also is connected by rail to cities along the Northeast Corridor. 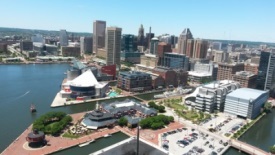 The Cruise Maryland Terminal at the Port of Baltimore is approximately 30 minutes from Baltimore-Washington International Airport (BWI) and curbside taxi service at the airport can take you to and from the port. Parking is $15.00 per day (rates are subject to change by the MD Port Administration). Traveling From the South - Follow I-95 North to Exit 55, Key Highway. From the ramp, stay straight on East McComas Street. The South Locust Point Cruise Terminal’s entrance is on the right. Traveling From the North - Follow I-95 South through the Ft. McHenry Tunnel, and be sure to be in the right lane when going through the tunnel. Take Exit 55, Key Highway. Turn left at the traffic light onto East McComas Street. Follow the signs to the South Locust Point Cruise Terminal’s entrance on the right.